A superb tone for adding some classic organ sounds to your arsenal. 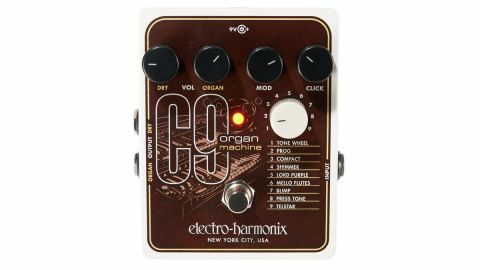 If EHX's first Organ Machine, the B9, provided the foundations, the C9 takes the potential sky high with nine new organ emulations. We're talking prog-tastic fifth-up sounds, Light My Firekeys and Brian Eno-esque shimmers. Like the B9, tracking is superb, although there's still some slight latency to the organ signal. While conventional organ effects - a laDeep Purple, Led Zep et al are available - the additional versatility offered by presets such as the dead-on Strawberry Fields Forever Mello Flutes make this a better buy than the B9 in our book.